Cross-platform development tool vendor Embarcadero Technologies Inc. this week released an upgraded version of its studio product with increased connectivity and mobile options. RAD Studio XE7 emphasizes building modern apps with the ability to connect mobile devices and desktop computers with the growing universe of gadgets, cloud services, data and APIs, the company said. It also features FireUI, which provides a new way to share one UI codebase for different targets, with the possibility to optimize certain components for different devices. RAD Studio XE7 is an umbrella package that includes specialized products targeting different programming projects, such as C++Builder, Delphi and HTML5 Builder, along with the InterBase multi-device database engine. The new version is an upgrade of the XE6 product portfolio, released in April. In addition to the dominant mobile platforms -- Apple iOS and Google Android -- the studio targets Windows and Mac OSes. In fact, one of the main new features of the new release is the ability to extend existing Windows programs to Bluetooth-enabled devices via app tethering. Wi-Fi tethering is also available. 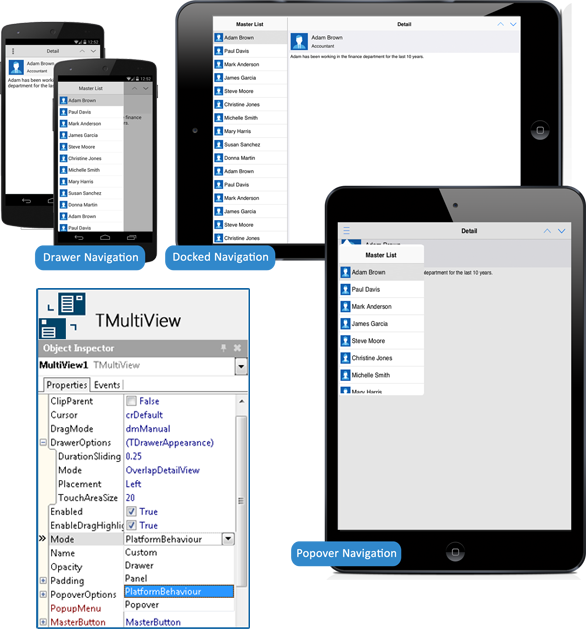 Existing Windows apps built with the Visual Component Library (VCL) or FireMonkey framework -- which is the base development and runtime platform underlying the Studio products -- can also be extended to external sources such as connected devices, sensors, data stores and services, including gadgets and wearables. Embarcadero provides code samples, primarily in C++ and Delphi, to work with diverse devices such as Google Glass, Chromecast, Amazon FireTV, Microsoft Kinect and even the quadcopter AR Drone from Parrot. [Click on image for larger view.] 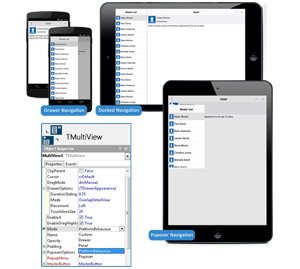 Building multi-device UIs with responsive menus using the MultiView component. "One of the biggest challenges for Windows developers today is extending their existing applications beyond the desktop to participate in this new world of mobile devices and connected gadgets and wearables," the company quoted IDC analyst Al Hilwa as saying. "RAD Studio XE7 takes aim at these challenges with key technologies for multi-device development, enterprise mobility and device connectivity. This is a great opportunity for those developers to create new user experiences for their customers and users." 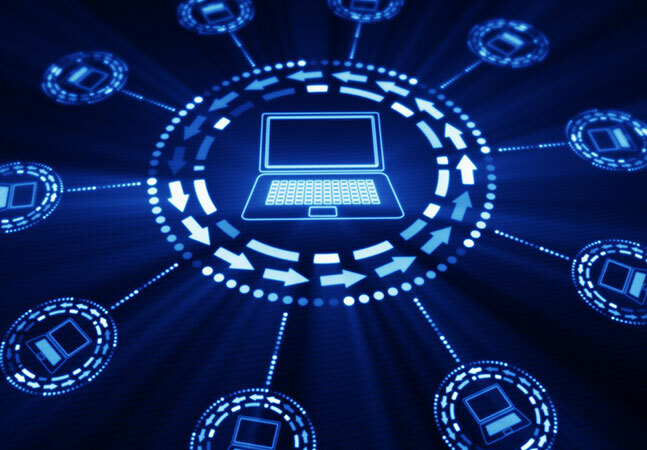 Other new features include Enterprise Mobility Services, a middleware service that takes care of some of the tedious programming required for tasks such as securely connecting to back-end databases from mobile or desktop apps. Based on the open REST HTTP calls and JSON data formats, the server hosts loadable custom API and data access modules and provides SQL database drivers and an integrated, encrypted SQL data store. Also new is a Parallel Computing Library that can enhance the performance of existing multi-threaded C++ and Object Pascal code running on multi-core systems. "In today’s increasingly connected world, developers are challenged to extend the user experience of existing Windows applications to new devices and form factors, and transform existing applications into modern solutions that their customers and users will love to use," said Embarcadero exec Michael Swindell in a statement. "RAD Studio XE7 is a game-changing opportunity for developers to be able to easily and quickly revitalize, performance enhance, and extend existing Windows applications with connected mobile devices, gadgets, sensors, and both cloud-based and on-premises services for customers in various vertical markets. "For example, Delphi and C++ developers can easily add table-side order-taking or cloud-based 'your table is ready' push notifications for food services customers," Swindell continued. "Product and price barcode lookups can be easily added to apps for retail customers and staff, or connected bio-health sensors can be added to healthcare office applications and biosciences research applications." The Studio products are available now with numerous configurations and pricing schemes.